The Killers Return, Guitar-Rock Holdouts In A Pop World The quartet, which won an international following with the 2004 debut Hot Fuss, is one of the last stadium-rock acts left on the radio. Battle Born is the band's first album after a five-year hiatus during which the members were tested by personal loss. 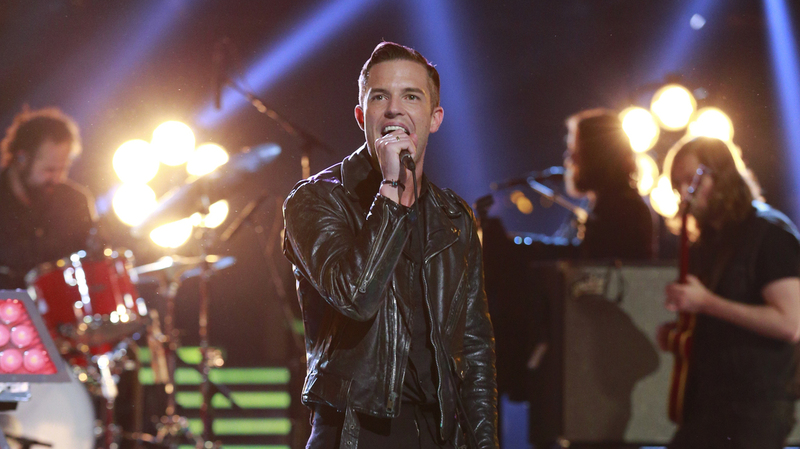 The Killers perform on the season finale of NBC's The Voice last week. The Killers, who won an international following with their 2004 debut Hot Fuss, have been called the last American-born stadium rock band. This year the quartet released its fourth album — and it wasn't easy. Battle Born came just five months after Tommy Marth, a friend and frequent collaborator of the band, committed suicide in April. "He was just a close, close friend of ours who played on saxophone on our songs," says Killers drummer Ronnie Vannucci. "Some of us grew up with him. ... Whenever we wanted to put some horns in a song, we'd call upon Tommy to help us out with that. He made us sound good." The Killers were in the middle of making Battle Born when Marth died; it was their first time in a studio in years. The band had taken a break from its relentless tour schedule after the release of 2008's Day & Age. Then, two years ago, lead singer Brandon Flowers' mother died of cancer. "You know, I am fortunate to have had the time that I had with my mom," Flowers says. "Some people lose their parents when they're young. I already had two sons and a family of my own started." Flowers and his bandmates had a lot of time to think, and the singer says they found themselves drifting back in time. "Most of us grew up on a healthy diet of British rock and British pop music. Then as we got older, these influences started making their way in — things that our dads listened to," Flowers says. "And now you've got this mix of The Cure and New Order and The Beatles and this British stuff, and Tom Waits or Bruce Springsteen, all these people that started getting introduced." August Brown, a music critic at the Los Angeles Times, says The Killers' unique mix of influences makes the band unique — and that's not necessarily a good thing. "Quite frankly, to look around and see where the pop scenes and where underground is going; it is not in that direction, and I don't know what the future of that kind of songwriting is," Brown says. "I love it, I enjoy it — and I have long defended The Killers to some hipper-than-thou friends as really classic songwriters playing great rock music. But I don't know who their peers are coming up right now." Vannucci says he's been paying attention to pop radio and does not disagree with Brown. "You don't hear guitars on the radio like you used to," he says. "You listen to all this perfect music: great songs, but they're so perfectly in tune and perfectly tailored, and they sound artificial in a way. It's so weird to be on the radio and have our songs ... next to songs like that." The four members of The Killers are all originally from Las Vegas and got their start playing in typical Las Vegas venues. "We have a buddy [who] would get together indie nights and open mic nights at cafes wherever he could — that was when we were first starting," Flowers says. "He found this hole-in-the-wall transvestite bar — it was called Tramps when we played it. One Sunday per month, Tramps became an indie dance club. We played for record labels in Tramps, our parents would come to Tramps, and there would be stray trannies walking around. It was a strange time." Flowers says Las Vegas and its surroundings still provide him with inspiration. The Battle Born song "Miss Atomic Bomb" gets its name from a beauty pageant held during the 1950s nuclear tests in the Nevada desert. "It is a strange thing to celebrate," Flowers says. "There are some great, iconic pictures of the first Miss Atomic Bomb, and I realized, 'This is a fantastic title.' And I instantly saw a partnership that it had with 'Mr. Brightside,' one of our previous songs." Brown says Battle Born is not his favorite Killers album, but the band still knows how to make explosive rock. "I think they really just believe in the power of rock music to move people in a way that they believe no other genre can," Brown says. "I think they really have a belief in the power of the three-minute rock song to stick with you from your teenage-dom through the end of your adulthood, and they want to write those songs for you." That's what the members of the band were hoping to hear. Vannucci says the important thing about The Killers in 2012 is that the four members are still making music that means something to them. "It's not so much about the record," Vannucci says. "Although we kind of joke about it living up to its name because of how long we took with it."